I purchased this sign on Ebay, knowing it had issues and needed restoration. I have it now, but need to find out exactly what I need to fabricate. Does anyone have one of these that can take some photos and measurements of the rear of the sign? Still looking for advice or help. Thank You. When the sign is lit the colors change, amazing! Here is another Crosley illuminated sign. 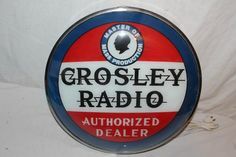 If you can find out who manufactured that Crosley Coloradios sign then you might be able to track down other signs of lesser collectability that may feature the same casing and possibly internal motor as does that Crosley Coloradios sign. 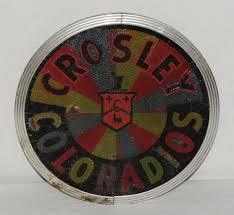 I'm sure there's a Crosley Coloradios sign out there somewhere that has a seriously damaged or missing face plate. You just need to find it. I have one, I'll see if I can find out the dimensions for you and take some pics. Too bad I didn't see your ad back when you posted it as I was living in Columbus then. Also surprised that I didn't see it when it was on ebay. I believe that it's like most of the bubble clocks from the time period. It was made in '50 or '51. Thanks Guys. my particular sign does have issues, one being a cracked face, but I have never had the chance to own one before. That is a bummer about not getting together when you were here. It would have been easier to try to duplicate what you have. I look forward to the photos and measurements.